This script allows you to create “enemy events”. Whenever an enemy appears in battle, the enemy’s event pages are added to the current troop’s event pages. The purpose of this script is to allow you to create an enemy’s events once and then re-use it in multiple troops without having to duplicate event pages yourself. Furthermore, not only can you re-use your event pages, but the pages are only added to the current battle if the enemy actually “appears”. This means that if the enemy was initially hidden (through appear halfway), the pages are not added until the enemy appears. Enemy events are just regular troop events, except they will be added to the current battle if the enemy is present. All of the event commands can be used as usual. event pages commands will be updated to point to the enemy’s current index. screen, and then create your command and point to the slime. correctly update itself to point to the slime. When a battle begins, all enemy event pages will be added to the current battle. For example, if your slime has two event pages, then those two event pages will be added to the current troop. 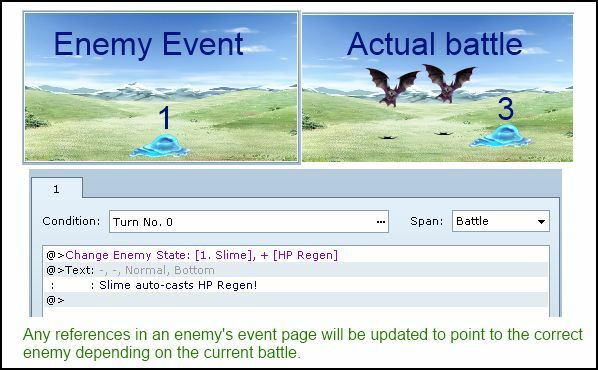 If the battle has two slimes, then each slime will contribute its own event pages to the battle, resulting in four additional pages. The script doesn’t update the index of the enemy in the battle event conditions, or in the control variables (if you wanna give to a variable the value of the enemy’s HP, you can’t do that). # updated to the enemy's current index in the troop. how does it work with events that target the entire troops? Does it work with several of the same enemy in the troop? I have troubles with that last case.